James Stewart and Grace Kelly. 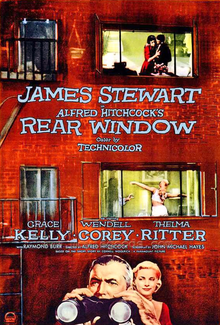 Rear Window is a 1954 film about a photographer, laid up with a broken leg, who spies on his neighbours from his apartment window and becomes convinced one of them has committed murder. Directed by Alfred Hitchcock and written by Cornell Woolrich (story) and John Michael Hayes (screenplay). [regarding Thorwald] That's no ordinary look. That's the kind of a look a man gives when he's afraid somebody might be watching him. The New York State sentence for a Peeping Tom is six months in the work house...They got no windows in the work house. You know, in the old days, they used to put your eyes out with a red-hot poker. Any of those bikini bombshells you're always watchin' worth a red-hot poker? Oh dear, we've become a race of Peeping Toms. What people ought to do is get outside their own house and look in for a change. Yes, sir. How's that for a bit of home-spun philosophy? Lisa: [preparing to leave] I'm in love with you. I don't care what you do for a living. I'd just like to be part of it somehow. It's deflating to find out the only way I can be part of it is to take out a subscription to your magazine. I guess I'm not the girl I thought I was. Lisa: Not for a long time...[pause]...at least not until tomorrow night. Lisa: How far does a girl have to go before you notice her? Jeff: Well if she's pretty enough, she doesn't have to go anywhere. She just has to be. Lisa: Well, ain't I? Pay attention to me. Jeff: Well, I'm, I'm not exactly on the other side of the room. Lisa: Your mind is. When I want a man, I want all of you. Lt. Doyle: You didn't see the killing or the body. How do you know there was a murder? Jeff: Because everything this fellow's done has been suspicious: trips at night in the rain, knifes, saws, trunks with rope, and now this wife that isn't there anymore. Lt. Doyle: I admit it all has a mysterious sound. Could be any number of things - murder's the least possible. Jeff: Well, don't tell me he's an unemployed magician amusing the neighborhood with his sleight-of-hand. Now don't tell me that. Lt. Doyle: It's too obvious, a stupid way to commit murder in full view of fifty windows? Then sit over there smoking a cigar, waiting for the police to come and pick him up? Jeff: Officer, go do your duty. Go pick him up! Lt. Doyle: Jeff, you've got a lot to learn about homicide. Why, morons have committed murder so shrewdly it's taken a hundred trained police minds to catch them. That salesman wouldn't just knock his wife off after dinner and toss her in the trunk and put her in storage. Jeff: I'll bet it's been done. Lt. Doyle: Most everything's been done - under panic. This is a thousand to one shot. He's still sitting around the apartment. That man's not panicked. Jeff: You think I made all this up, huh? Lt. Doyle: Lars Thorwald is no more a murderer than I am. Jeff: You mean to say you can explain everything that's gone on over there and is still going on? Lt. Doyle: No, and neither can you. That's a secret, private world you're looking into out there. People do a lot of things in private that they couldn't possibly explain in public. Lisa: Like disposing of their wives. Lt. Doyle: Get that idea out of your mind. It will only lead in the wrong direction. Jeff: What about the knife and the saw? Lt. Doyle: Did you ever own a saw? Lt. Doyle: How many people did you cut up with it? Or with the couple of hundred knives you probably owned in your life? Your logic is backward. Lisa: You can't ignore the wife disappearing and the trunk and the jewelry. Lt. Doyle: I checked the railroad station. He bought a ticket. Ten minutes later, he put his wife on the train. Destination? Meritsville. The witnesses are that deep. Lt. Doyle: [looking at Lisa's open overnight bag] Do you tell your landlord everything? Jeff: I told you to be careful, Tom. Lt. Doyle: If I'd have been careful piloting that reconnaissance plane during the war, you wouldn't have had the chance to take the pictures that won you a medal and a good job and fame and money. Lisa: What's he doing? Cleaning house? Jeff: He's washing and scrubbing down the bathroom walls. Stella: Must've splattered a lot. Stella: Come on, that's what were all thinkin'. He killed her in there, now he has to clean up those stains before he leaves. Lisa: Stella... your choice of words! Stella: Nobody ever invented a polite word for a killin' yet. See It! - If your nerves can stand it after Psycho! The most unusual and intimate journey into human emotions ever filmed !